The first plane of main body landed today. Thus, the summer season has officially begun. I suppose that means that my stay here has come nearly full circle. For, a year ago today I left Connecticut headed for the unknown. And after all this time, it is largely remains so. Antarctica says so many things. Yet it's difficult to hear. One person may have the most rewarding experience of their life while another finds months of boredom. I suppose that I fall somewhere in between. The sights of summer and the trials of winter were something that I'm fortunate to have experienced, but I don't think that I quite need another year to learn that Antarctica gets cold and dark. Essentially, what you see is a rainbow, or halo, around the sun not formed by raindrops, but ice crystals that are blown high enough to shroud the sun. In other news, I've posted flyers giving notice that I'm selling both my laptop and my Xbox. Lots of bites on the laptop, but no one has yet offered up a deposit. I think that I have channel fever. One the submarine, anytime we getting close to pull into a port, the excitement level almost reached a fever pitch. Not only were we excited to get off the boat after long months of confinement, there was also a biological component that explained our behavior: the introduction of fresh, oxygen rich air. By and large, the O2 concentration was deliberately kept low in order to reduce the risk of fire. In fact, it was so low at times that cigarette lighters would not easily light off, if at all. This also took a toll on us, the crew. I was almost always a bit tired and had difficulty concentrating. But when the submarine surfaced and the hatches opened, fresh air would circulate throughout the boat. It was if we were rejuvenated or given a shot of adrenaline. This time instead of fresh air, it's the roar of a jet engine. It's the sound of civilization, which exists only 12 days away somewhere beyond the horizon. I have about 5 people lined up to buy my laptop. Still waiting on a deposit from Tammy before I start going down the list. I'm sure that I'll miss it. It's been like a good friend over the past year, keeping me in touch with my wife, serving as a source of entertainment, as well as keeping me abreast of world affairs. I can't imagine how I would have survived without my electronic friend. The good news is that I won't have to carry it around while on vacation. I tend to get very paranoid about having such high priced items laying around my hotel room unsupervised. Yet, it's inconvenient to carry it with you. Mailing it home isn't an option given the condition of my XBox when it arrived last year. I'm afraid that it will somehow be given the "gorilla test" as was the suitcase from the famous ad campaign a few decades ago. Besides, I have two computers at home already plus a laptop out on loan. A fourth is entirely unnecessary. Spent the night at Scott Base saying goodbye to the winter over Kiwi crew. I'm hoping to get up with some of them back in New Zealand at some point, depending upon how Ella's and my itinerary plays out. Around town: population probably swelled above 500 with the influx of people who started arriving on Monday. So far, two planes have arrived with two more scheduled for tomorrow. Jordan and one of the operators, Greg, arrive on Saturday. The new people are too vibrant...reminding me of, well, myself a year ago. The galley is noisy and crowded and there are actually lines forming at the serving lines. This a marked departure from the winter when there wasn't a line for anything. Also, we had regular tables and groups that people kind of stayed loyal too. Now, it's difficult to find a seat, let along one near your winter over buds. The two planes, a C-17 carrying cargo and a C-141 with 42 passengers, were boomeranged today due to visibility. However, the low clouds lifted in the late afternoon after giving us some light winds and a dusting of snow. Temps above 0, perhaps even 10. Dunno yet how the bumped flights will affect my departure date as it puts my replacement's arrival back a day as well. Jordan and Greg are now slated to fly in on Sunday. Took a nap in the afternoon after some Salisbury steak landed in my stomach like a ton of bricks. Of course, this threw off my sleep for the night. No planes again today due to hazy conditions on the ground. But just like yesterday, the skies cleared in the early afternoon. I took a walk down to Hut Point for some pictures. And what a photo op it was...sundogs and some of the best photos that I've snapped this year. Of course, when you have material like yesterday, it's not too difficult to be a half way decent photographer. Anyway, here's perhaps the photo to top them all. I happened to be on the far side of the Discovery Hut looking east and saw the sun over the hills. 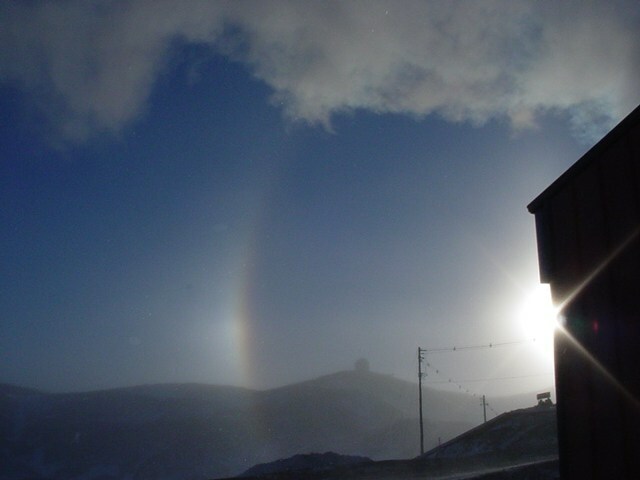 The sunlight filtering through the ice crystals created a series of concentric sundogs almost directly above the hut when I looked toward the NASA tracking station. Talk about being in the right place at the right time. In the evening, I watched the first half of an A&E miniseries about Shackleton. I think that this aired earlier this year, but since we don't receive premium tv channels, we missed out. Now if I can only be so fortunate to see the second half before I get out of here. Yet again, weather prevented the planes from making it in. There are a lot of antsy people around town. People who have spent too much time on the ice and are anxiously waiting for good weather so that they can get out of here. Like me, for instance. I still don't know if I'll be able to get out of here on time. But just in case, I told Ella to begin making plans to spend the first few days of her vacation alone. And if I'm delayed too long, she'll meet in me in Chch instead of Auckland and we'll just concentrate on the South Island instead of trying to take in both halves of New Zealand. Received a deposit on the laptop as well. Looks like it's a done deal. I haven't seen that much cash in a long time. Which reminds me, I don't think that I've ever addressed the issue of money here on the ice. I've probably overlooked it as it's really irrelevant. It's hypothetically possible to not spend a dime your entire stay on the ice. Your room and board are taken care of and unless you want an occasional beer or need some toiletries, then you don't need to visit our ATM. Aha. Planes at last, bringing Jordan (last summer's power and water tsar) and Greg Towns, an operator from the previous crew. Smiles and handshakes all around. The summer electrician also arrived. All are experienced folks and have been on the ice many times. I'm sure that they will have a good year together. Looks like good weather for the next few days. But as far as I'm concerned the only two that matter are Wednesday, when my replacement arrives, and next Monday when the bird that takes me home needs to land. The plane also brought me a new roommate, Tim. He's a decent bloke who's spending his first year on the ice. Unfortunately for him, he came down to work as a dining attendant. Although I didn't want to break it to him, I informed him that none of the DAs who started last summer made it through the entire year. As a matter of fact, I don't know of any that made it through just the summer. They had to re-staff before the stationed close. Washing dishes is a dirty, thankless job anywhere in the world, especially here. I got a new look in the evening. Seeing as how Ella doesn't like my beard, I started getting rid of it today. And over the next few days I'll sport a new look each day until it's all gone. In other news, another 141 landed and brought gobs more people and I received the money for my laptop. So, it's official: I'm selling it. I've started to back up my hard drive and will turn it over on Sunday. Replacements arrived today!!! So, the second most important plane of the year has made it safely to Mactown. The most important, of course, is the one slated to fly next Monday. Bought a few razors and some environmentally friendly shaving cream in a tube (the only kind sold in the store) and shaved my neck and chin for the first time in over a year. It was pretty damned painful, if I must say. Dunno if it was due to the poor quality of the razor, the not so lathery shaving cream, my lack of control of the blade or just sensitive skin, but I had no less than three cuts on what little bare skin I touched up. Also noticed that my face was much more sensitive to the cold now that my facial hair is almost gone. Given a choice getting food and orange juice pulp trapped in a year's worth of beard or having a cold face, the beard is a no brainer. Packed up the XBox and several other boxes o' junk and mailed them home. Cost=$80. And the price of a stamp is now $.37. Jesus, when did mail get so expensive? Spent a few minutes at the "Tatty Flag" in the evening and exchanged some American money for Kiwi dollars. Also hoped to say goodbye to any of the winter over Kiwis. But, they've already left. Instead, I had a few beers and politely listened to some tourists who, mistaking me for a newbie, attempted to educate me on Scott Base and Antarctica in general. Rather than embarrass them, I made my escape before 8:00. The earliest I've ever left. Today's shave: handlebar mustache. BTW, the absence of my beard probably makes people think that I just arrived. No one recognizes me anymore. Meet the two new operators, Brian and Dave, and started bringing them up to speed. Both good guys. Dave, like many other people down here, has done some interesting stuff. Among them is mountain climbing in Denali National Park last year. There's only a few familiar winter over faces around town now, perhaps a dozen at most. And we're leaving on Monday....barring the unforeseen (heaven forbid). Anyway, it's almost as if we have a secret handshake or gang sign as we tend to acknowledge each other's presence now, even if we didn't talk to them during the winter. My name's on the board for bag drag (hauling your luggage to be weighed and I did my last full shift at the plant. The new guys are up to speed and the only thing left for me to do is keep my fingers crossed for good weather come 1730 Monday. Also, got invited back next year to do it again. Although it's premature to even think about it, there's some satisfaction in knowing that I was at least considered enough of an asset to have the position available should I, with Ella's blessing, choose to return. Lastly, as I'm selling my laptop tomorrow, I'll be unable to make updates to the journal until I return home next month and pick up where I left off. By then, I'll have had a few weeks to think over my time here and hopefully think of a fitting epilogue to conclude this humble chronicle of mine. In the meantime, thanks for dropping by over the last year and for all of the emails, letters, and goodies. Circumstances permitting, I'll try one day to visit all of you kind folks.